The Policy Brief notes that stopping this resurgence in youth drug use will advance a positive school climate as well as community health and safety. This requires strengthening drug prevention efforts by funding more capacity to enable local communities to address local problems. Download the PDF here: Could Youth Drug Use be Making a Comeback? Is the Stage Set for an Increase in Youth Drug Use? Inadequate resources for youth drug prevention services over the past eight years may very well have created the possibility for a potential crisis in youth drug use. Although the nation experienced a 29 percent reduction in youth drug use that began around 1997, this decline leveled off in 2006. Since then, drug use among youth has remained flat or has increased for certain drug types. However, this decline has been accompanied by a “softening” of youth attitudes about the perceived dangers of illicit drug use. If history repeats itself, there will be a marked increase in youth drug use as well as associated problems and health care costs. The primary way this crisis can be averted is through a network of prevention programs that already exist but are often overlooked or underfunded by policy makers. What is behind the Softening of Attitudes? From 2002 to 2008, there was a distinct emphasis on drug supply reduction over drug demand reduction. During its tenure, the previous administration increased resources for supply reduction efforts by 64 percent while increasing demand reduction resources by 9 percent. More significantly, the area of the national drug control budget that suffered the most was prevention; funding amounts were decreased by over 10 percent from 2002 to 2008. In fact, drug prevention was the only federal drug control effort ever to be cut, compared with funding for the other key components of a national drug control strategy—treatment, law enforcement, interdiction, and source country programs. While the cause for the cut in prevention funding is unclear, there is reason to believe that at the time more spending might have reversed the softening of youth attitudes about the dangers of illicit drugs. Figure 1 is based on the annual Monitoring the Future (MTF) Study produced by the University of Michigan. This graphic in itself is not meant to suggest a causal relationship, but advances in prevention science confirm that a relationship does indeed exist. 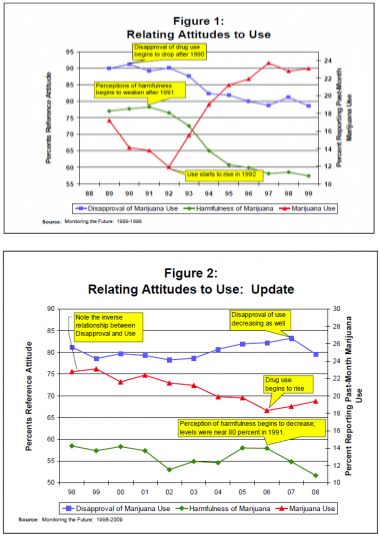 The figure shows 12th grade marijuana use, perceptions of risk associated with use, and use disapproval percentages. According to the figure, youth first began to perceive drug use as less risky after 1991, while in 1992, youth drug use was at its lowest point. This means attitudes among youth had already begun to soften before use reached its lowest point. Since use rates were so promising, no one foresaw that within five years youth drug use would reach almost record-high levels. If the past predicts the future, the current administration may face a problem similar to the one faced by the Clinton administration. Figure 2 updates Figure 1 to show trends in attitudes and youth drug use over the past 10 years. Note the inverse relationship between use and disapproval of use: use decreases when disapproval increases and vice-versa. A similar relationship is seen regarding use and perception of harmfulness, with use rates increasing over the past three years and the percentage of 12th graders perceiving use as harmful decreasing by 10 percent since 2006. Bear in mind that almost 80 percent of youth surveyed said regular marijuana use was harmful in 1991, and currently only 50 percent say it is harmful. This most recent weakening of attitudes may mean further increases in youth drug use are forthcoming. Indeed, as Figure 2 shows, past month use of marijuana by 12th graders did rise during the 2006-2008 period. Other examples of programs designed to work in a similar manner are the Safe and Drug Free Schools and Communities Program (SDFSC) and the Substance Abuse and Mental Health Services Administration’s Strategic Prevention Framework State Incentive Grants. These programs enable states and local communities to effectively and appropriately identify risk and protective factors and target attitudes that are key to reducing youth drug use. In recent years, both programs have demonstrated positive measurable outcomes in reducing drug use and providing the necessary prevention infrastructure to advance a positive school climate as well as community health and safety. If these programs are so successful, why didn’t they prevent the potential crisis that now threatens us? One explanation is capacity. Much more funding is needed, and very little has been provided in this decade. Also, cuts in federal prevention funding have had an effect and may continue. Some programs, such as the State portion of the SDFSC, may be eliminated entirely under the proposed 2010 federal budget. CADCA notes that this termination would eliminate the only source of funding for school-based prevention programs serving 37 million youth per year. While the nation has been celebrating its success in reducing youth drug use, this celebration may be short-lived. History has shown that the current climate seems ripe for an alarming increase in youth drug use. Providing prevention resources to engage communities in embracing evidence-based programs, policies, and practices is the most cost-effective and reliable solution.